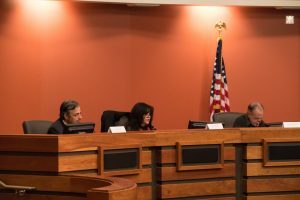 Some legal woes of the Tulare Local Healthcare District could soon be resolved, after the district’s board of directors voted to settle lawsuits with Healthcare Conglomerate Associates (HCCA). HCCA, the management company which formerly oversaw operations of the district’s Tulare Regional Medical Center, was involved in two cases with the district: one legal action filed by HCCA in Los Angeles Superior Court, and another filed by the district in the Bankruptcy Court for the Eastern District of California. The board’s 3-2 vote — Xavier Avila, Stephen Harrell, and Mike Jamaica, voting in favor; Kevin Northcraft and Senovia Gutierrez dissenting — on Wednesday night settles both of those cases. Board members did not take action on other closed session items, including a long-running lawsuit against the district by the hospital’s former Medical Executive Committee, or a lawsuit against Celtic Leasing, which provided funds to HCCA for a leaseback of certain hospital assets. The board also deferred any action on a potential sale and leaseback of the Evolutions Gym. Currently, HCCA holds a deed of trust against the gym’s land, including the undeveloped land adjacent to the gym. Both board members and the board’s attorneys declined to elaborate on the terms of any potential settlement. “The board is unable to go into specifics of the terms of the settlement agreement at this time, but will do so as appropriate,” an attorney for the hospital read after closed session. Public reaction to the addition of a potential settlement to the meeting’s agenda; and, separately, the potential sale and leaseback of Evolutions, was mixed. Jennifer Burcham, a Tulare resident, said that she was confused after seeing the items on the agenda, noting that the board hadn’t previously discussed them in public. “There is now an item placed on a closed session agenda where an action will probably be taken and the citizens don’t know what it’s about, what is going on, or how it might affect them and this community,” she said. Alberto Aguilar, a former member of the hospital’s bond oversight committee, recommended the issue of the leaseback be discussed in open section. He claimed that it would be illegal for the board to discuss the sale of the building and its subsequent leaseback in closed session. “If the board enters into an agreement regarding the sale of Evolutions, and that individual knows that the transaction was done in an illegal manner, he can have it voided. So can any member of the public,” Aguilar said. Later in the night, the board’s attorneys rebutted those claims — stating that Brown Act provisions allowing the board to meet in closed session overruled that section of the California Health and Safety Code. Joseph Soares, a Tulare attorney, supported the board’s consideration of the agreement. Dan Heckathorne, the hospital’s interim CFO, said that by filing multiple supplemental program reports, the district is able to bring in upwards of $1.5m. “Most of these represent reports that were required to be filed with Medi-Cal and previously had not been filed,” he said. Heckathorne told the board that some reports dating as far back as 2014 — previously unfiled — were sent to the state for reimbursement. Those reimbursements, while helpful, won’t help the district survive the months to come. Responding to a question from the audience regarding the district’s cash position, Heckathorne said that it’s nearly reached a breaking point. “Starting next week, we’re projected to be in the hole $166,000, the following week $367,000, the following week $116,000; then we have a positive number, then we come back into the hole $118,000, in the hole the following week $529,000, in the hole the following week $204,000, we go up the next week, and then we come back to only $383,000,” he said. Additionally, as of March 22, the hospital has a grand total of $33m in accounts payable, including approximately $8.5m claimed by HCCA. That’s split up between $6m in post-bankruptcy debt and $27.4m in pre-bankruptcy debt. The district filed bankruptcy on September 30, Heckathorne noted, so some post-bankruptcy debt was accrued before control of the hospital was taken back by the district. “There are accounts payable out there for still running the hospital between October 1 and November 22,” he said. An audit by the State of California continues as well, Heckathorne told the board. He estimated that the auditors were only “10 to 15” percent done, and said auditors continued to visit regularly to inspect files and conduct interviews. During the meeting, an attempt to solicit proposals for long-term hospital management partners was put on ice after significant debate by the board. Northcraft, the board’s chairman, suggested that hospital staff begin a request for proposals process so that the public would be confident in any future arrangement. “We want to assure the public that we’ve done our due diligence,” Northcraft said. Avila, with Harrell seconding, motioned to table the idea until the next meeting. The other board members disagreed with the idea, believing that the move could signal to Community Medical Center, the hospital’s preferred partner, that the board was not confident in their services; or, alternatively, that the process could slow down a reopening of the hospital. “We’re out of time,” Avila said. The motion to table the discussion until the next meeting passed 4-1, with Northcraft being the lone dissenting vote. The hospital continues to have “free” unearned money coming in – from the district taxpayers, the state, medi-cal etc. Yet they are ever deeper in the hole. They are in bankruptcy protection so they dont pay the thousands of creditors owed money. The assets have shrunk mightily – losing $60 million in value in a year !! Northcraft asks for discussion to seek other proposals for ideas to help the hospital survive and he is shot down. Seriously? Someone says we need to stick with Community because maybe, like, we owe them? Yes that is good business I guess. At least Kevin partly gets it. the other board members are almost entirely clueless. One gets up on a soapbox and pontificates but says nothing significant. One, not sure if she understands the spoken word. One, sees how hard the current employees are working doing non patient care and feels good, we must be ready to reopen in 2 weeks by keeping them gainfully employeed so they are ready to go. We need staff to calibrate stuff and write new policies, hunt down clues, etc. The interim managers solemnly continue on, they are or will get paid, a lot, for this gig. In fact quite a few people have a good gig at this nonfunctional institution. They vigorously defend their current good fortune and tell the board members and public what they want to hear. There is nobody looking at this scenario with a critical eye ? Is this not the problem for many years ? Has anybody considered, even if it does open, the doctor who put more than half the patients into the beds and rounded on them in the middle of the night has been run out of town ? Other sad former employees stand like sheep outside the fence waiting for some hint of good news that they can get their jobs back like they are owed something. Somebody please put this hospital out of its misery. I agree we need Kumar, Benzeevi and the “old” board back, lol.Let’s not waste more time get CMC with their support staff in here fast. The discussion the other night was very confusing. CMC is not dragging their feet and we are working very close with them . The RFP is a long process and that is something we will have to do in the long term . In the short term we have checked with others and all of them declined. We need cash to open the Hospital and CMC are the only ones willing to do that . The RFP process we were talking about is not for a short term open the Hospital now . Going forward with an RFP process right when CMC is very close would have sent them the wrong message . I’m for opening the Hospital asap . Im not an attorney. Is the article saying that Wednesday nights vote settles the two cases with HCCA, and yet the board and its attorneys feel that the details of the settlements should not yet be revealed to the public? Do I have that right? Please tell me Im wrong. If the above is true, then for the first time I truly have a sense of hopelessness. The more things change, the more they stay the same. I remember one public meeting where Dr. Kamboj , while a board member, responded to a question from the public “We dont need to tell you! !” The current board is not as obnoxious as Kamboj but perhaps they are really no different. My understanding — and I apologize if I didn’t make it clearer in the article — is that they have not fully finalized and inked the agreement yet, so they can’t elaborate on it in case doing so would jeopardize their position. I’m watching PACER like a hawk. As soon as I see them enter in a notice to the court that they’ve reached a settlement, I’m requesting the actual settlement from the district. The settlement would be a public document. Tony is exactly correct ! We the new board would never tell a member of the public “ we don’t have to tell you “ . The truth is we can’t tell you but as soon as we can we will and we actually want to tell you . As far as “ hopelessness” the action we took just created a mountain of Hope to get the Hospital open . Read Kevin’s comments. He voted No and yet he responded with positive comments. Intellectually I know that the Board has been given the huge task and authority of being the hospital’s “decision makers” but emotionally I have a hard time trusting decisions being made these days due to the so many untrustworthy decisions made through the years with past Boards. I know that it is not fair to visit distrust on this current Board but there you have it…..I kind of do, especially when decisions are made behind closed doors. I tend to default to the “distrust” or at the very least “begin to question” what is actually going on whenever that happens. I am the same way with any public board that deals with taxpayer dollars; the City Council and Cemetery, etc. I dislike secrecy no matter the legality of it. This current board may or may not reopen TRMC. I sincerely hope they succeed but the chances against that actually happening are great (thanks to decisions made by past board members). In my mind, now is not the time to make such an impactful decision such as settling with HCCA without substantial open public discussions with taxpayers that covers “all” the pros and cons of the matter because after all it is the taxpayers who are the ones who are now and will continue to be impacted financially with or without a settlement. I don’t know the how, when, or where of it but if they decide this behind closed doors I believe that the current hospital board will lose far more than they will gain when it comes to public trust. People no longer give their trust without question and verification. This board would be wise to not shut out the public with their questions and opinions when making a decision on this matter. What happened to “Transparency”! Shame on this new board! Patriot could not have said it better The more things change the more they stay the same. I had high hopes for this group, very disappointing for this community. There is low public trust for the hospital in Tulare. The damage runs deep and it could take years to recover. By then the hospital business model may be changed. Has the board considered commissioning a survey to better understand what Tuleareans want the hospital district to provide? It seems like a rush to reopen when there is not certainty of success going forward. This takes leadership and thinking out of the box. Hiring a permanent CEO right off would be a good start. A lot of people want the hospital to start up and be “just like it was”. No one is talking about running it like a business. The board members, they are well intentioned but have no idea about the hospital business. Sell the assets that remain, get the tax payers off the hook. Once the tax money spigot is turned off, the schemers will look for an easier mark. Tired of hearing about this. Same old song. This board needs to stop pointing fingers at the last board because they too are falling short of making good decisions. We have one that flip flops and the lady doesn’t talk. Tax payers are doomed at the rate this board is going. Good grief! They want Community Medical Center because Family Healthcare Network has taken over Community Medical Center’s clinic operations. FHCN will soon be sending all their patients from all their clinics to Community because they have a feud with Kaweah Delta. If Community takes over Tulare’s Hospital it’s a win for FHCN and Community. Well…maybe not entirely true, but not so false either. FHCN is doing some kind of deal to run CMC clinics in Fresno. FHCN and KDH have never “gotten along” and they are competetors. FHCN patients in Tulare county do not have the ability to drive to CMC. So…a local facility to house the FHCN in patients may be a reasonable idea for CMC. Xavier, welcome to the world of behind the scenes rough and tumble politics of big money health care services. Thats what happens when big govt dumps truckloads of pubblic money to take care of medi-cal and federal qualified clinic patients. Plenty of backroom deals to get some of it. So Benseevi who almost single handedly bankrupted the hospital is going to get a payoff. The allegations are that he lied, cheated and stole from the hospital totally mismanaging everything and after destroying it he gets to take another big dip into a borrowed cash bucket and walk away smiling, a rich man who duped the city of Tulare, again. There was essentially no money left in the hospital – the receivables that were being reported weren’t there, another inept action by HCCA. Financials aren’t adding up and that puts question on the last audit. Then you have the contract that would have to be litigated to have it tossed out or definitely portions of it. The contract language was horrible for the District. That means ongoing legal fees. The entire time we have a closed hospital with no money. It is definitely time to recognize we were extremely duped, analyze how it happened and then vow to start standing up to this type of action in the future. Yes, lets look to the future. Perhaps the hospital is dead and if so , perhaps money would be more wisely spent on pursuing legal action against HCCA and others (Kumar) that , as result of the audit are found to be involved in malfeasance rather than trying to re open the hospital. The current management aint cheap. I am sorry to say that for some, there is money to be made in promoting the false hope that the hospital can be re-opened. So it may be that the best our community can hope for is to recoup some of the stolen money . We should NOT allow the board to make a settlement with HCCA without permission from the community. We must not accept Avilas judgement the “we cant tell you ….and we actually want to tell you” Ms Avila, that is not acceptable. You MUST tell us what kind of deal you are making with HCCA BEFORE you, the board, signs anything!!! I understand there is no money however, it would be an injustice to this community to not proceed to exposing and prosecuting every single person in this community who benifited or by their action or inaction allowed this travesty to happen. If these people ( Kumar first on the list ) are allowed to walk away with no repercussions for their actions … then be prepared for the mistakes of the past to be repeated. Very interesting! The board is considering a “deal” with HCCA, who is their mortal enemy? There is definitely MUCH MORE to the story. The board really is causing the back fire to themselves. You made most people to despise HCCA and now you’re making deal with them? I have learned in life that for most cases, the good guy versus the bad guy is really subjective on which side of the fence you’re on. This is why there are perpetual wars in our world. Continuation of seeing everything one sided. Most people have come to despise HCCA not because of the board but because HCCA did so much damage to tulares hospital. They drove away the doctors, drove away the patients and mismanaged the hospital so that it couldn’t pay it’s bills. Then after insisting all the employees work for HCCA it took away many of the employee benefits, bounced paychecks and didn’t even bother to pay them their earned PTO. No HCCA earned earnef their reputation on their own. thetruth = Benny. Give him a few sheckels and move on. Then sell the place and pay off the bills. Question. If the hospital was sold, would there be no more hospital in tulare? or would someone else reopen it as a hospital. Most likely it would reopen as a health care business of some kind and jobs would return. let the economics decide its fate naturally. If theres really a need for a hospital in Tulare, some one will fill the vacuum. If it makes sense. Another possibility………It may well be a good idea to think outside the box…..expand and use the ER on first floor of the hospital to be a 24-hour Walk-In Urgent Care Unit. Lease out other parts of the hospital as doctor offices to doctors that come from surrounding towns that have patients from Tulare. They can send their surgical patients to hospitals in Visalia, Hanford, Porterville, Clovis, Fresno, etc. There would also be room for a much needed facility that specializes in the care and treatment of people who have a variety of mobility issues, ie amputees, stroke victims, cerebral palsy, etc. There is a huge population with needs that can’t be met at Evolutions. There are many rooms in that hospital that could be converted and filled with service providing offices in and around the medical field. Other hospitals themselves could also possibly consider leasing a satellite clinic office that would be a good fit. And all would generate money! A question to the board since they do seem to be here from time to time. Now that a deal has been made with HCCA, now can the past and present employees and residents of Tulare know what price we all have paid to ransom the hospital back from Benzeevi? What have we given up to the man that destroyed the.hospital to begin with? What price was paid to the devil? I’m reading lots of comments and ideas here but I never hear them being presented at board meetings. I say put up or shut up. The current board is doing the best that they can. Don’t whine about the public not being told if you are not there to hear one way or another. There are 3 spots coming up on the board this fall, sign up if you can do it better. We need a hospital, not another Urgent Care. And if the hospital cannot be reopened what then Lisa? No Plan B’s????? I am assuming that members of the board follow the Valley Voice closely as the majority of Tulareans seen to be reading it more so than probably VTD. If they take the time to read the comments being posted then they are indeed being presented with ideas and opinions from the very people they represent. There are many who are not able to physically attend pubic meetings but can and do share their thoughts and opinions online. So dear Lisa commentators are indeed putting up their comments and ideas for anyone who takes the time to read the Valley Voice (apparently much like you do), which hopefully includes hospital board members. Perhaps we will see your name on a ballot this fall. Putting them in a newspaper comment section doesn’t do the trick. The DA started their investigation against HCCA when citizens actually went to them to complain. The majority of people can physically attend hospital as well as city meetings. They just don’t until it all goes bad then they are full of opinions. If you can get online to post comments here, you can find the websites to see when meetings are. Lisa’s a troll. Adds nothing to the debate. That said, the current management interim company is getting paid plenty for managing the status quo. Keeping a few people employed. Some of them are even obstructionist. Board would be wise to consider hiring their own CEO who might have more incentive in developing the district business whether its in the hospital or otherwise. The present caretakers will do nothing of the sort. They are just babysitters. Remember it was THIS board who pulled the rug under HHCA and pulled the license. It’s so sad how this group bashed The old board for transparency. I feel that although they had good intentions, the grass isn’t always greener on the other side and they had absolutely no idea what they got into nor how the operational sides of the hospital was ran. Look at the all forseen overages such as calibrations, fees, etc were involved. This was poorly planned out. I am not a troll Enuf and you have no facts to back up what you said. HCCA was about to close the hospital permanently, the license had to be “suspended” to clean up the mess. I attend every board meeting with my husband and encourage everyone here to do the same or contact the board member in your district directly. My apologies. The V V does a great job covering the board meetings and hospital issues so people dont necessarily need to be personally present to form an opinion and suggest changes. Is a publicly funded hospital what Tulare needs? I dont know. maybe there are better more thrifty options that take my neighbors off the hook of paying millions in taxes for an institutiion that has been failing for some time now and if it opens, probably will fail again given the same approaches. Quote: “The V V does a great job covering the board meetings and hospital issues so people dont necessarily need to be personally present to form an opinion and suggest changes.” I totally agree with this statement. In fact I find that your entire post has merit. If no one ever asks the hard questions then there is a greater likelihood of history repeating itself as far as financial solvency goes. Better intentions does not necessarily guarantee better results. Ms. Gutierrez had every legal right to run for a seat on the Board. She also has “earned” that right to sit on that Board by winning overwhelmingly her district’s trust and support. As far as the United Health Center in Earlimart being a competitor, there is more than enough medical services need to go around even if the hospital was still up and running. Things change over time and hospitals more and more have competing competition when it comes to providing services to communities. Tulare itself has outside labs, x-ray facilities, etc. that work independent of TRMC. That said, I fully support having a financially solvent full service working hospital in Tulare. I hope this current Board is successful in bringing that about. I also hope this current Board is willing and open to working outside the box if push comes to shove on how best to use and repurpose the existing hospital buildings and its grounds IF the reopening of TRMC does not prove to be obtainable.